Visual Quotient » What’s that Squirrel-like animal? A small raptor took off from a tree a few feet from us. The cameras had captured some “record shots” and the field guides promptly came out. The prominent black wing-tips gave us the lead – Chinese Sparrowhawk. A lifer! Well, this was near Campbell Bay on Great Nicobar island. As we were celebrating this, we heard soft squeaks from the tree above. Tracing the source of the sounds, we chanced upon a small squirrel-like animal running up and down different branches. I was dumbstruck as I didn’t recollect reading about squirrels in Nicobar. Could this be what I think it is? A glimpse of the bushy tail. A long snout running through the leaf cover. It took some more minutes of desperate seeking before it appeared in clear view. A Treeshrew! A brief second later, it was gone again. 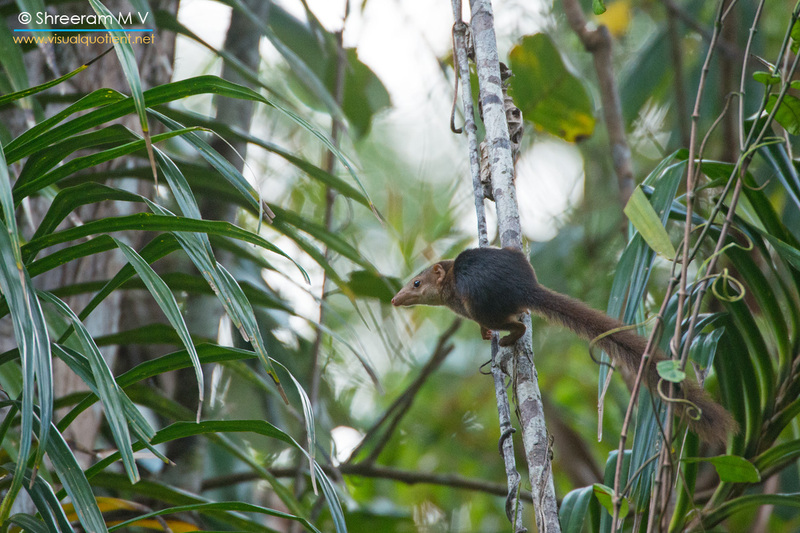 The Nicobar Treeshrew turned out to be reasonably common around Campbell Bay. We kept encountering this small mammal at different places, typically in forest patches where human interference was the least. The very busy animal that it was, it took me 3 more days before I could make the above photograph. Treeshrews are not shrews or squirrels. They are not even rodents. They belong to their own Order Scandentia. They are closely related to primates. In fact, they have been used in experimental medical studies as an alternative to primates. The 19 known species are all found in South and South-east Asia. They have the largest brain to body mass ratio amongst mammals. Indian has 3 known species of Treeshrew – Madras Treeshrew (found in Peninsular and South India), Northern Treeshrew (found in North-east India) and Nicobar Treeshrew (endemic to Nicobar islands). Remember a long discussion with Guru-G about Tree Shrews…thanks for this post. Very interesting write up on the Nicobar treeshrew. Lovely picture too, Shree. Glad you finally got to make an image. Your patience and perseverance did pay off in the end (Y).